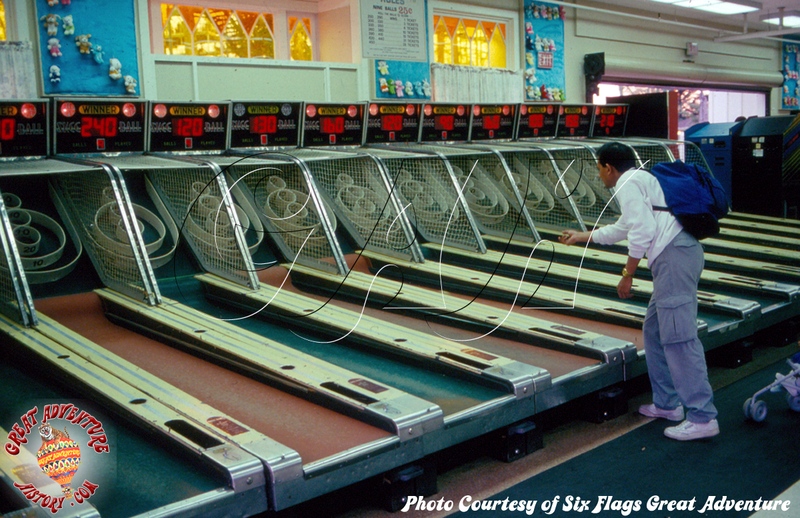 Skee-ball was invented in 1909 in the city of Philadelphia and quickly became a popular game at amusement parks throughout the country. Most theme park's also embraced the game, including the machines in their arcades. 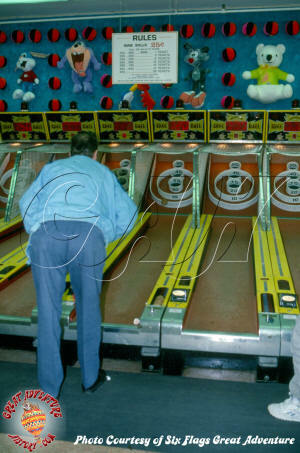 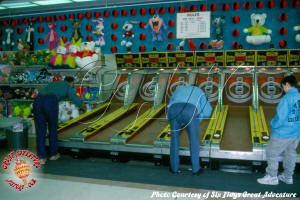 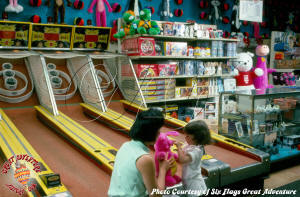 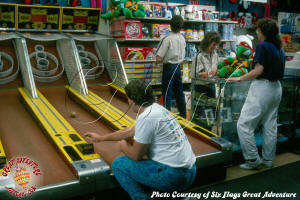 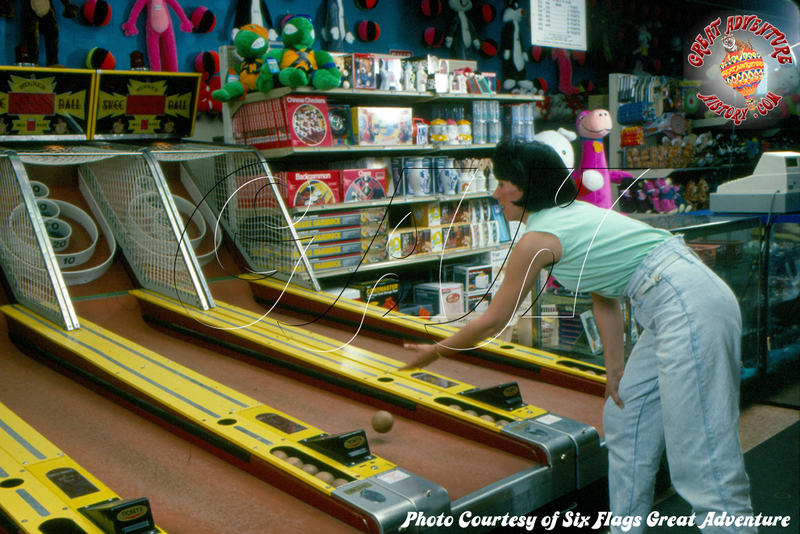 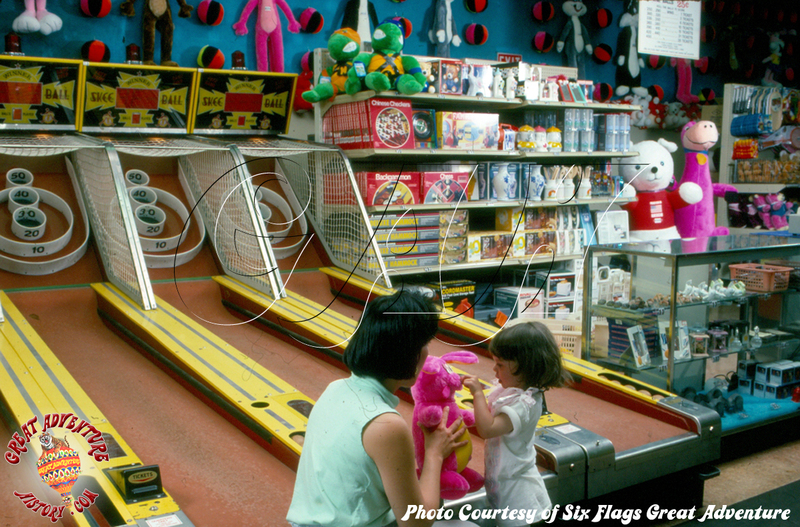 With the popularity of video games in the 1980's, many parks replaced their Skee-ball lanes with video games and other coin operated games. 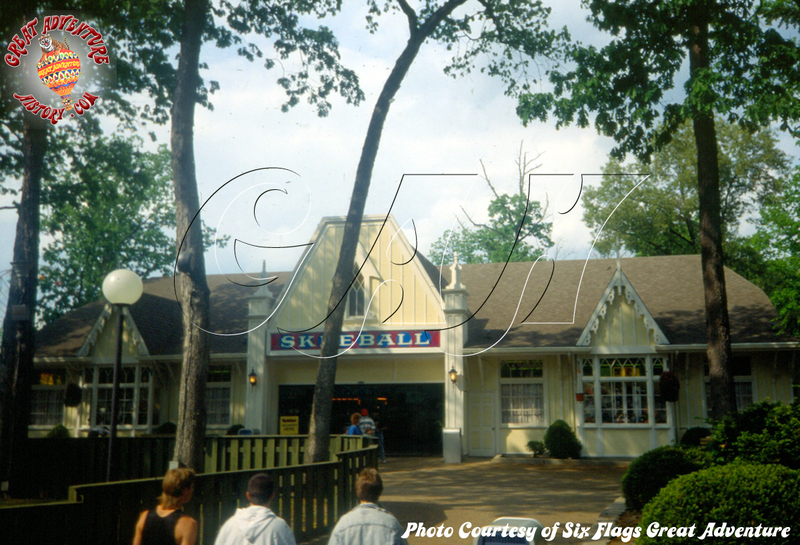 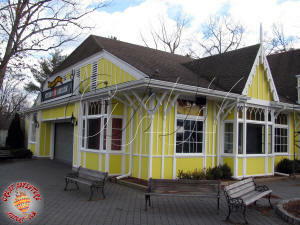 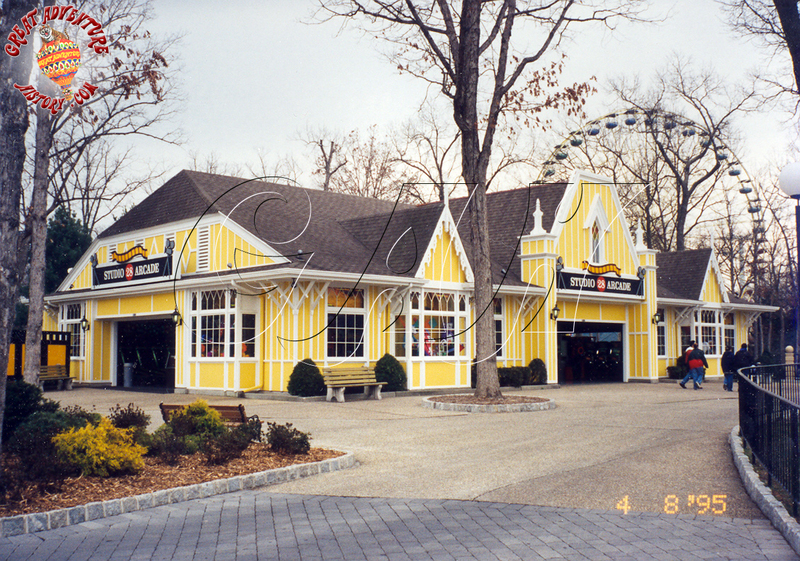 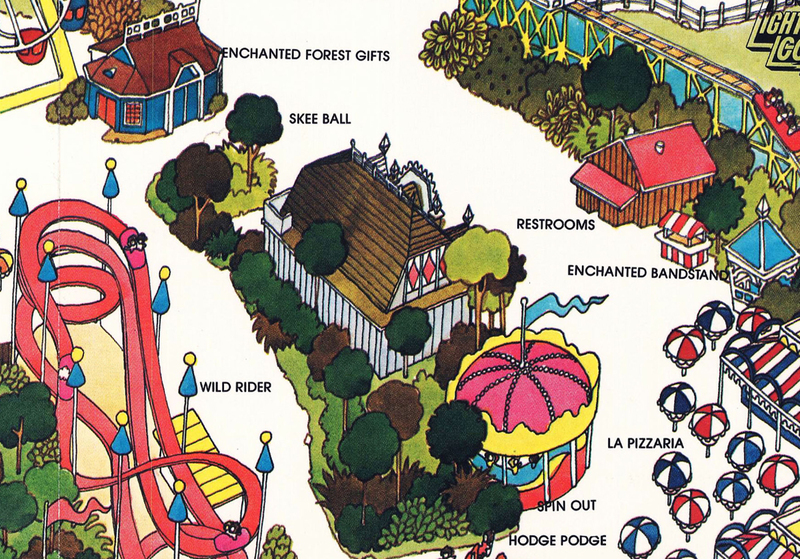 In 1978 with the continued expansions and improvements to Great Adventure under the new ownership of Six Flags, the Skeeball Barn was built near the former site of the Grand Prix go karts. 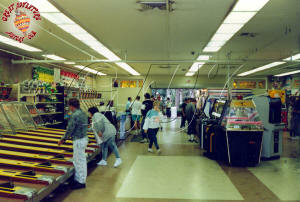 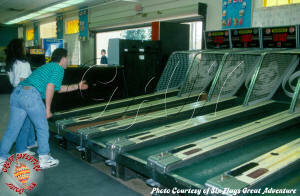 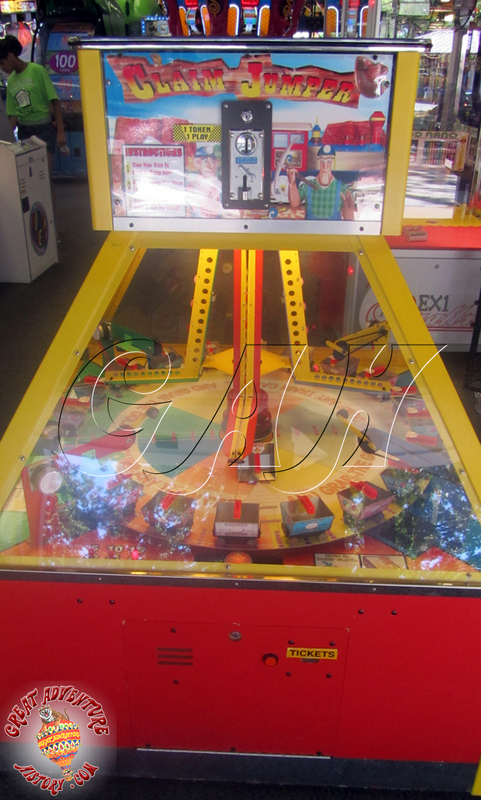 The large building featured dozens of lanes for guests to test their skills in this favorite game found at many of the local boardwalks up and down the Jersey Shore. 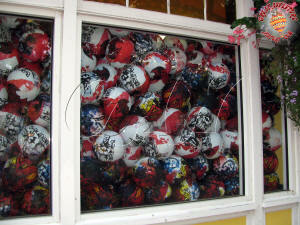 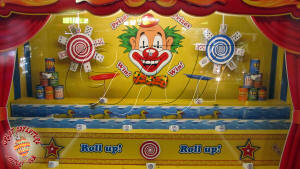 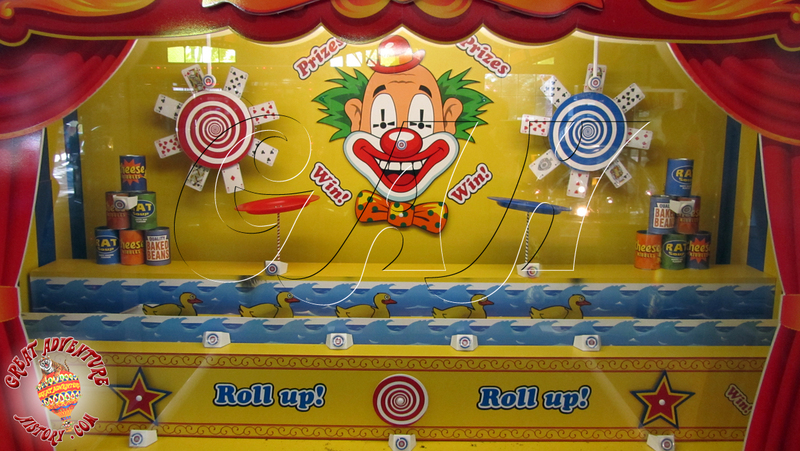 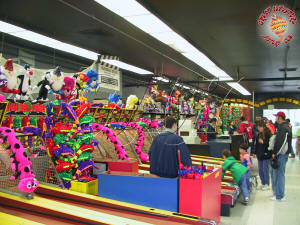 Guests could spend hours rolling the wooden balls and scoring points to accumulate tickets for prizes. 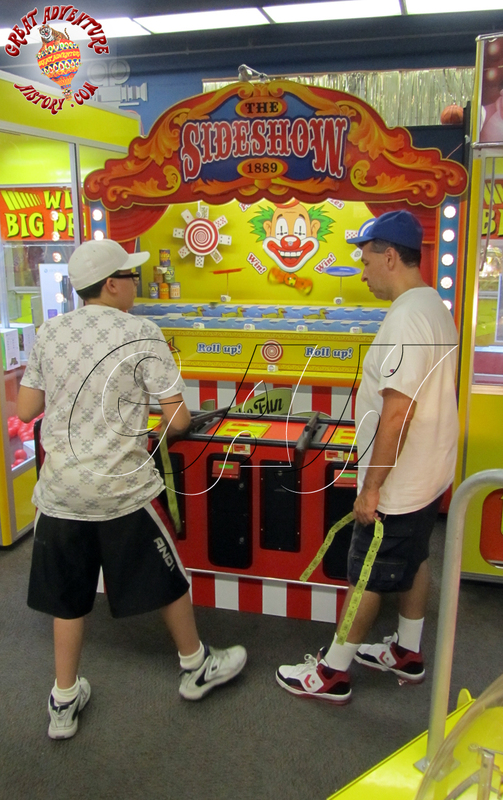 Prizes ranged from small toys to appliances with some guests accumulating the points from Skeeball and other games of skill in the park over the entire season and cashing in on the last weekend the park was open in October. It was common to see people carrying large boxes with electronics and other expensive prizes heading out of the gates on closing day after spending the summer racking up tickets. As the seasons passed, the Skeeball machines were slowly replaced as slot machine and other coin operated games became more popular. 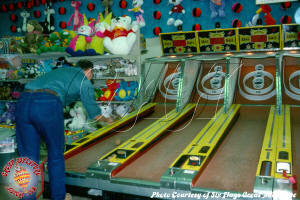 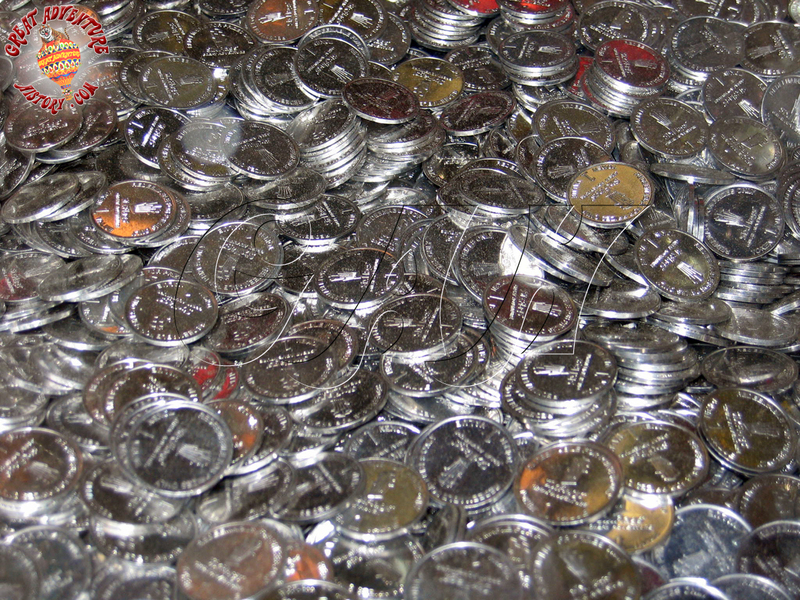 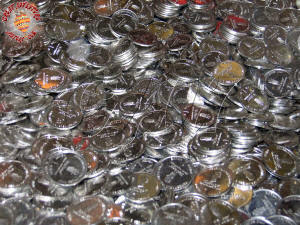 With the tokens having the same value as Skee-ball tickets it made sense to house the games together. 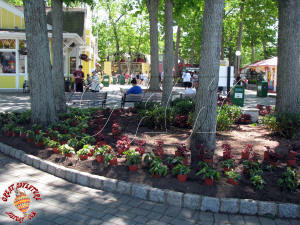 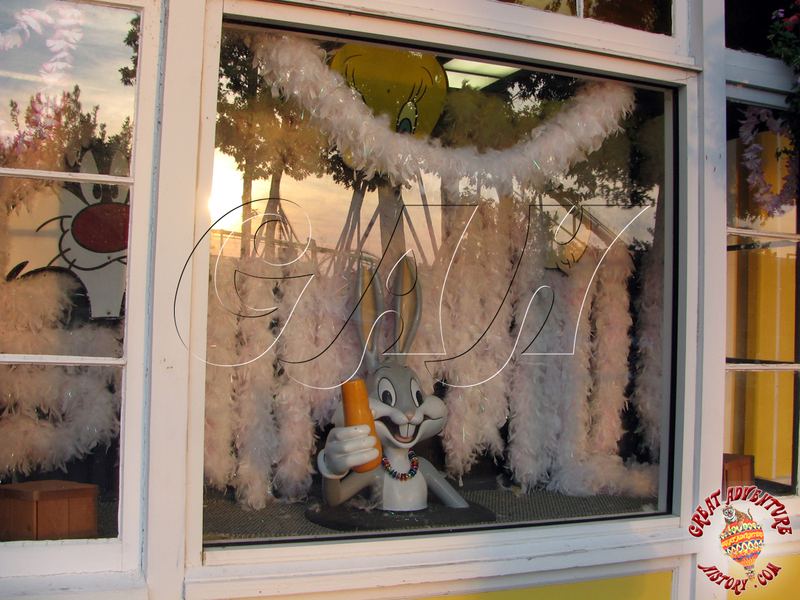 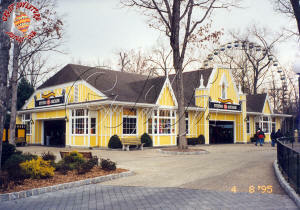 During the era of Time Warner owning Six Flags, many re-theme projects were proposed for existing structures throughout the park. 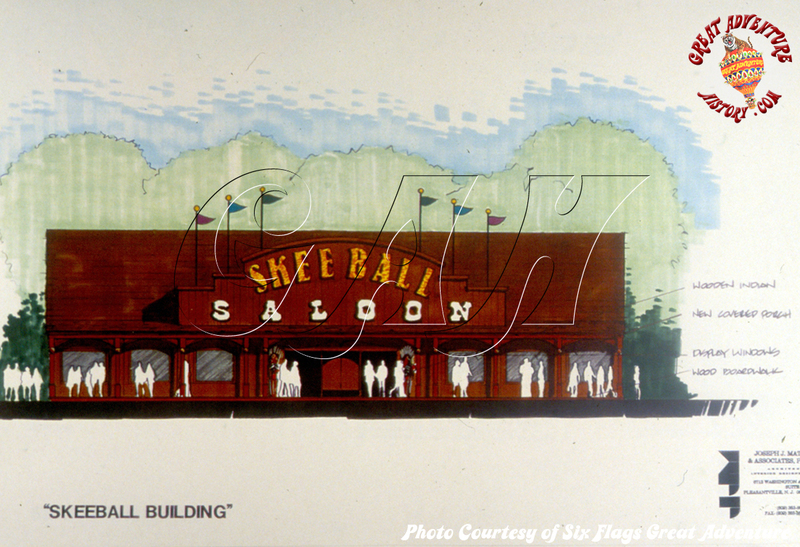 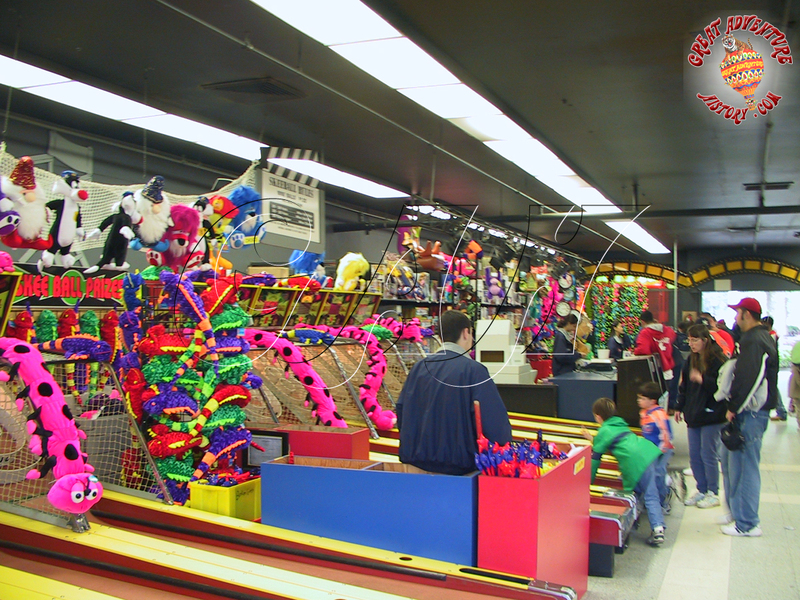 As part of the creation of Movietown, some of the structures were to be reimagined as movie sets, with the Skeeball Barn scheduled for a western saloon style makeover. This makeover never happened, most likely because of the existence of the western theme Frontier Adventures area on the opposite end of the park. Instead a simpler re-theme occurred. 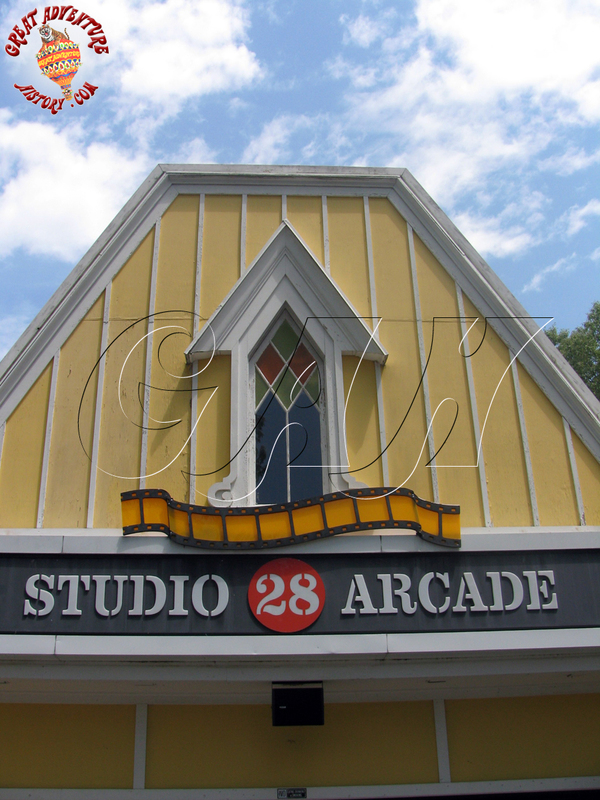 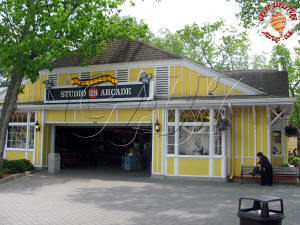 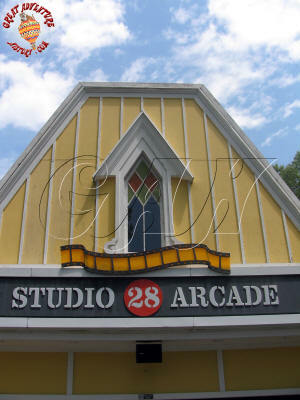 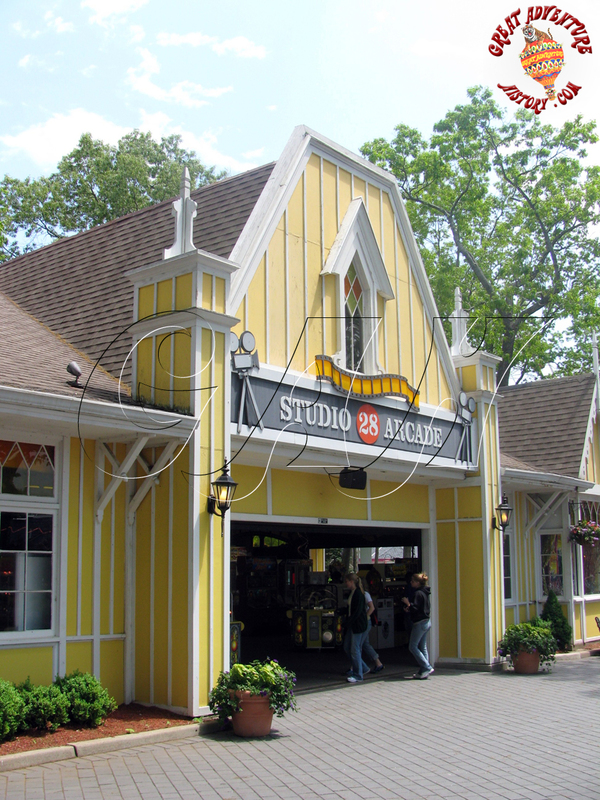 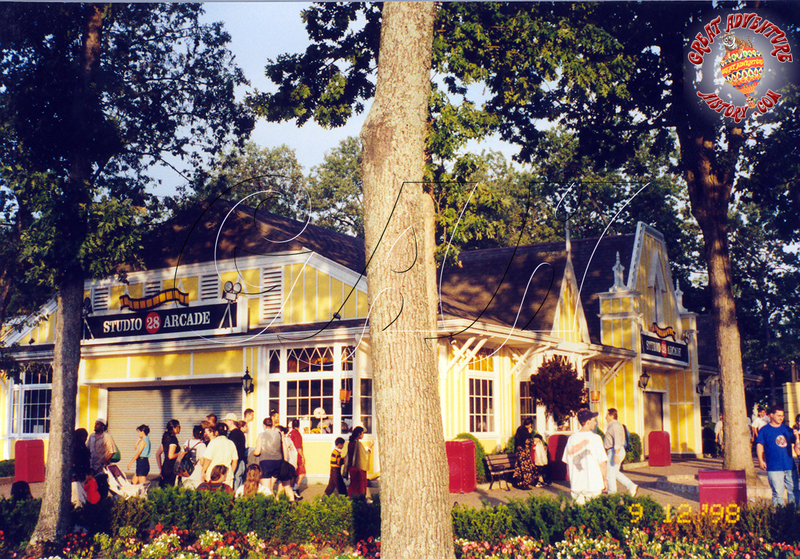 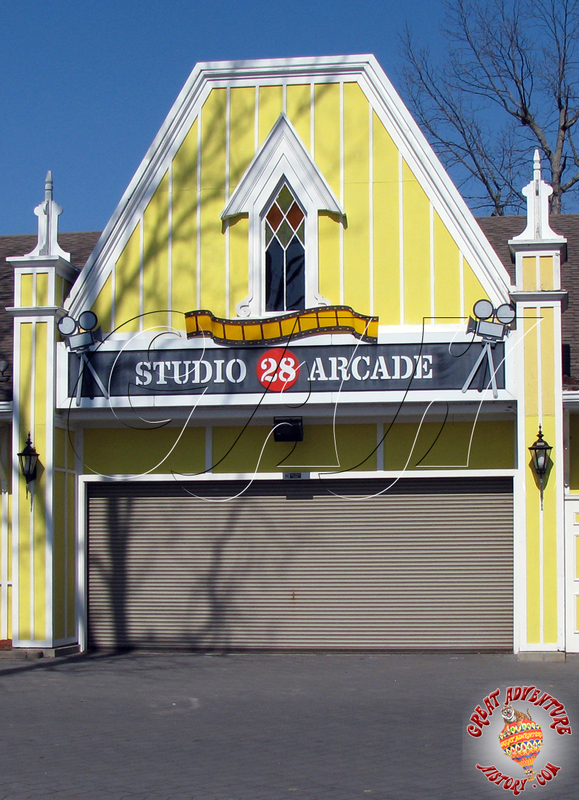 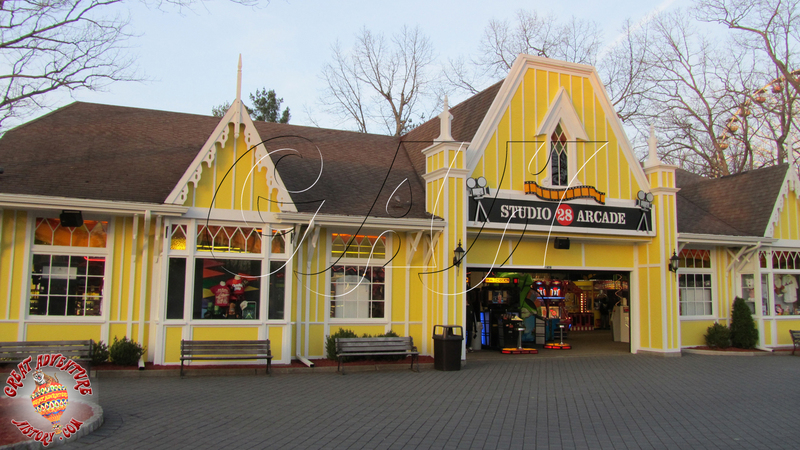 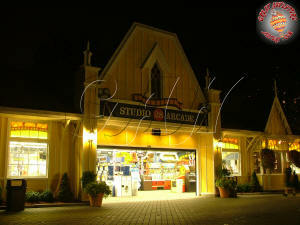 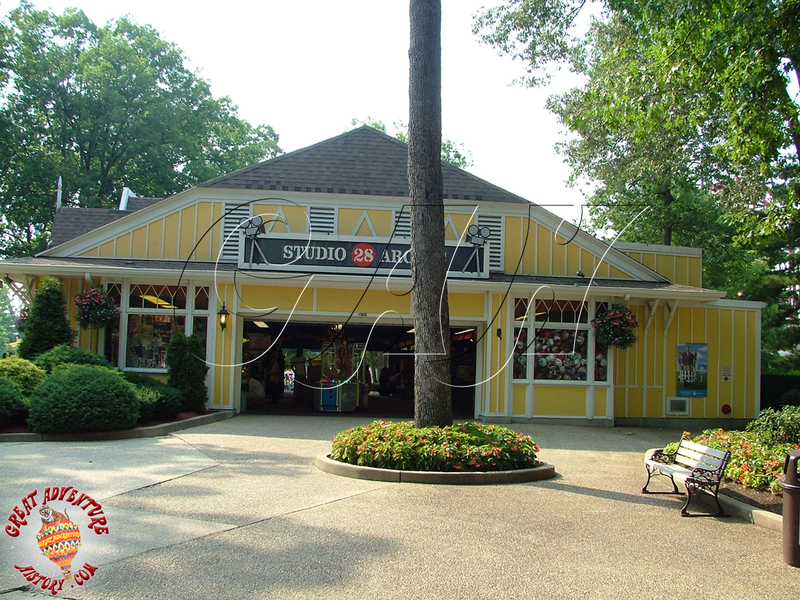 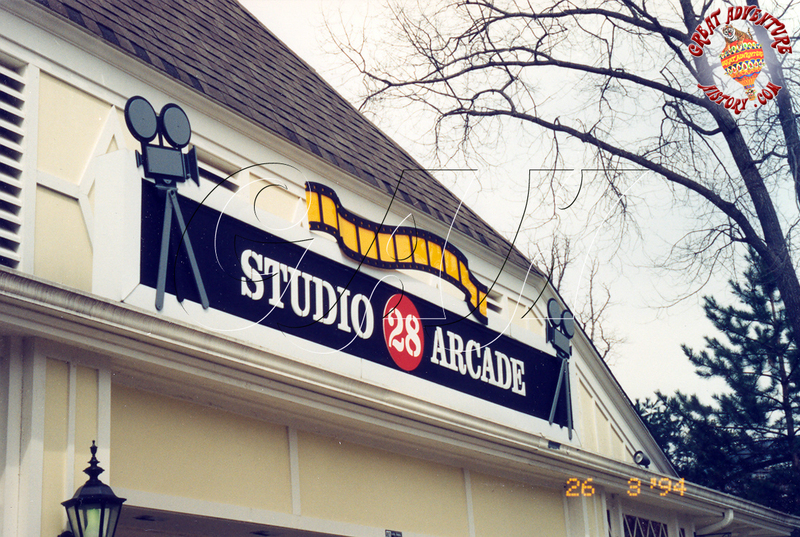 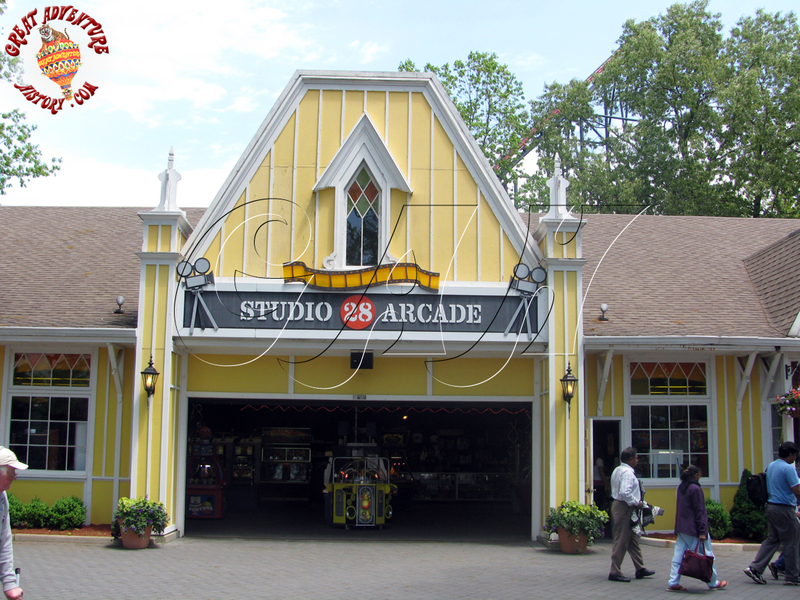 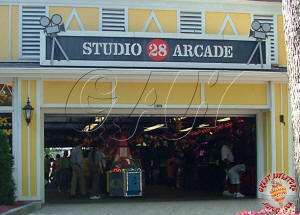 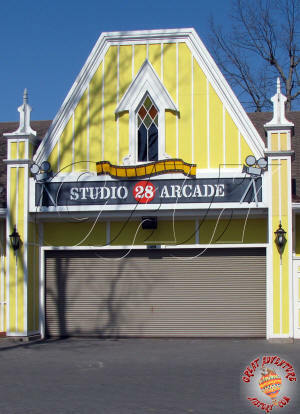 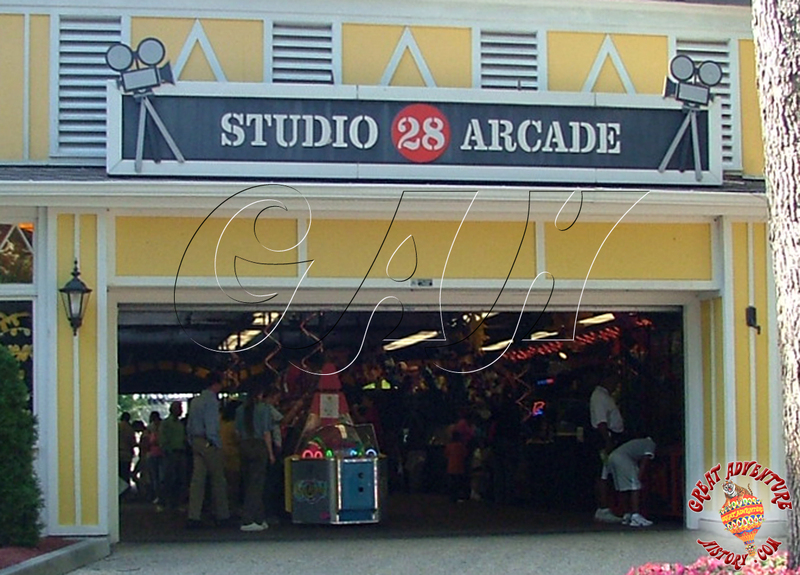 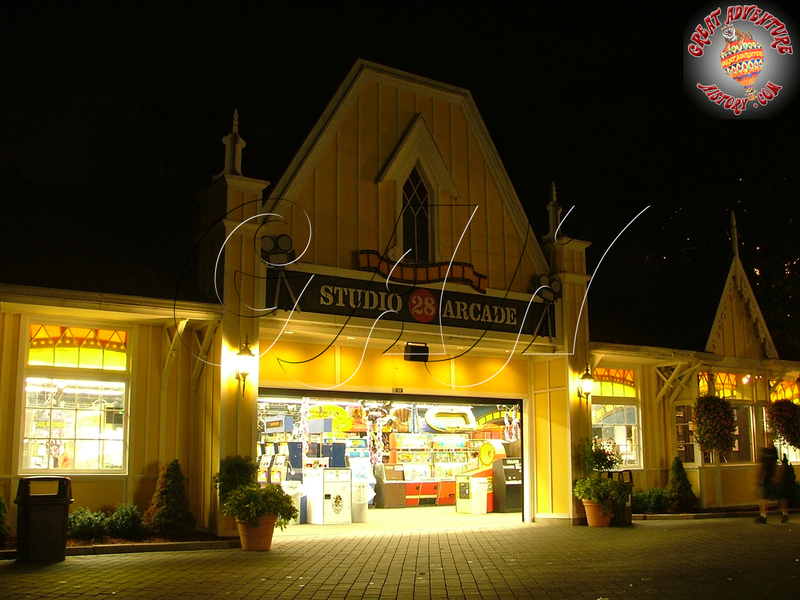 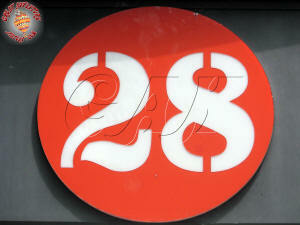 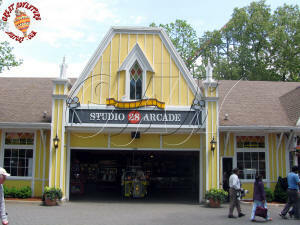 For the 1993 season the Skeeball Barn was renamed the Studio 28 Arcade as it was incorporated into the newly themed Movietown area of the park. The changes to the building were minimal, with signs being replaced. 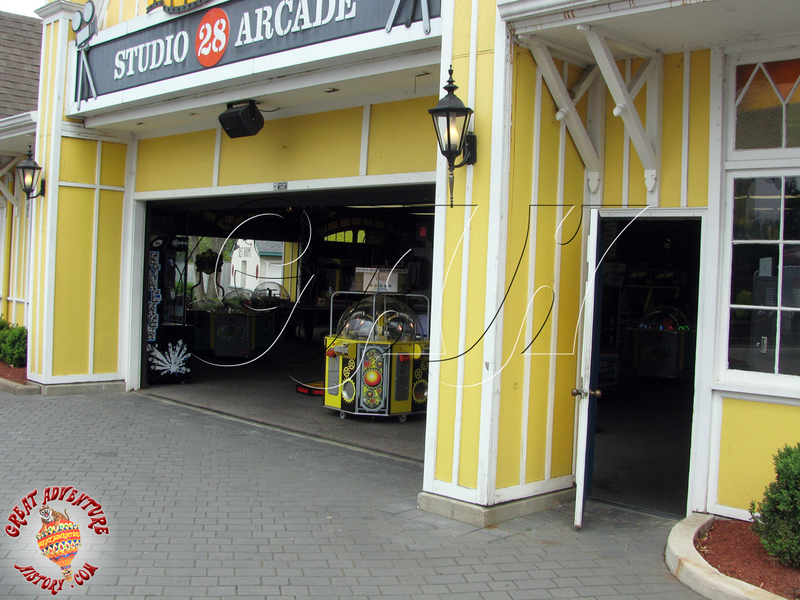 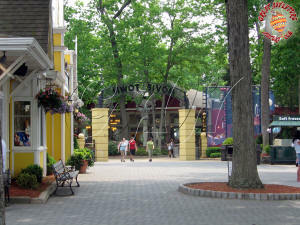 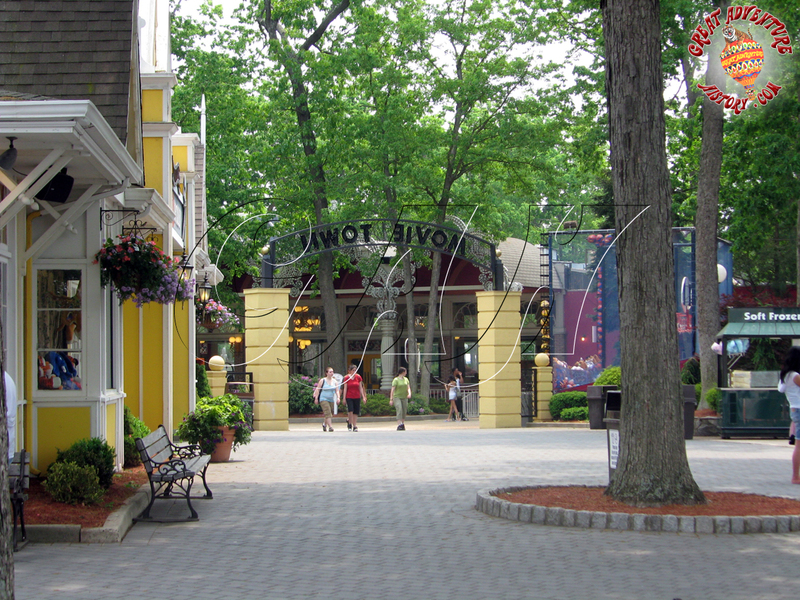 Just outside the Studio 28 Arcade the reconfigured pathways funneled foot traffic into the new portal with the Movietown name on the arch above the pathway as well as into the arcade itself. 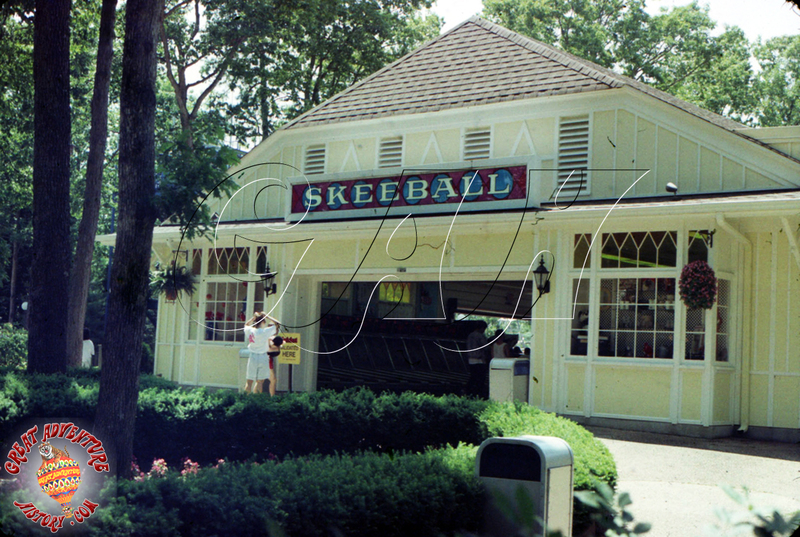 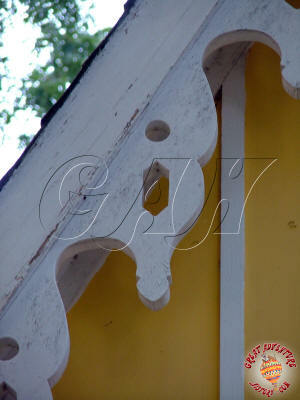 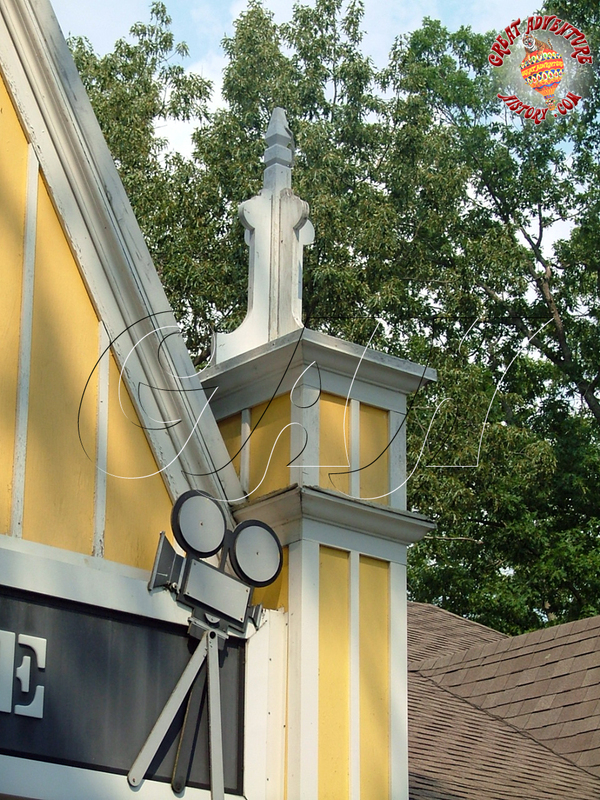 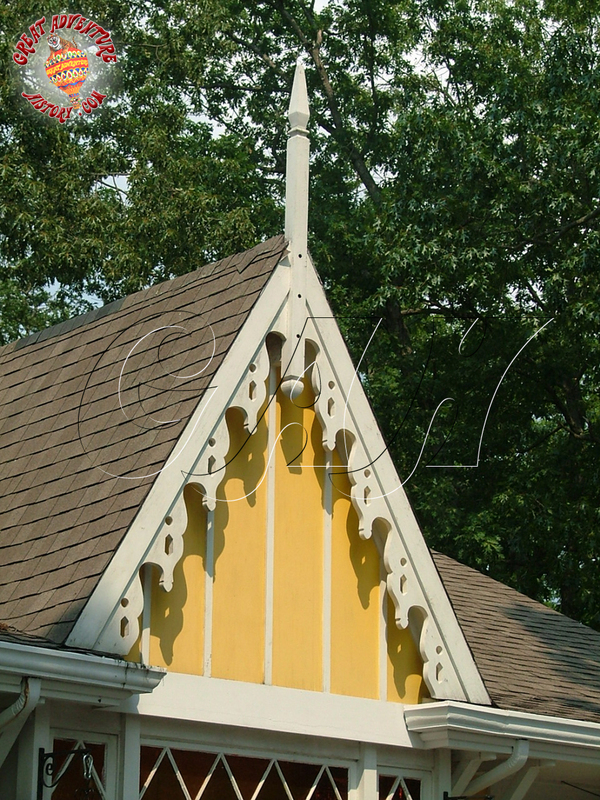 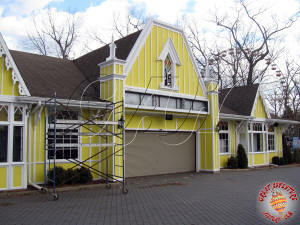 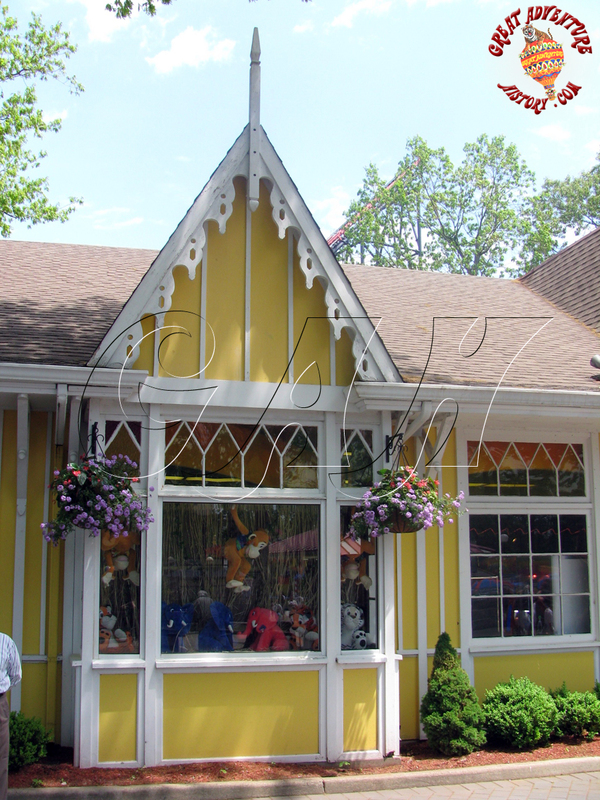 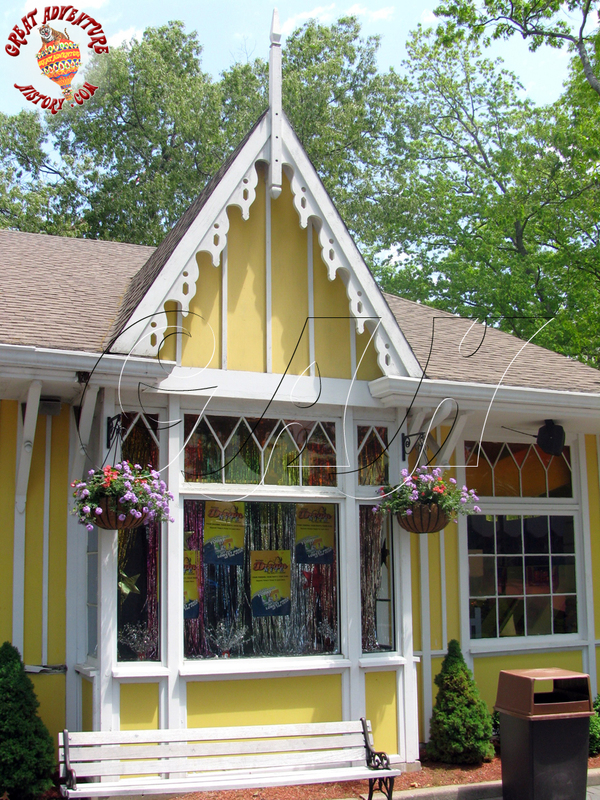 The Skeeball Barn was built with a some nice decorative touches to give the building visual interest. 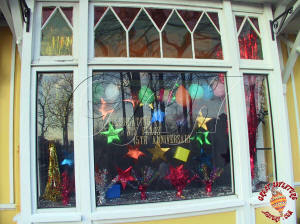 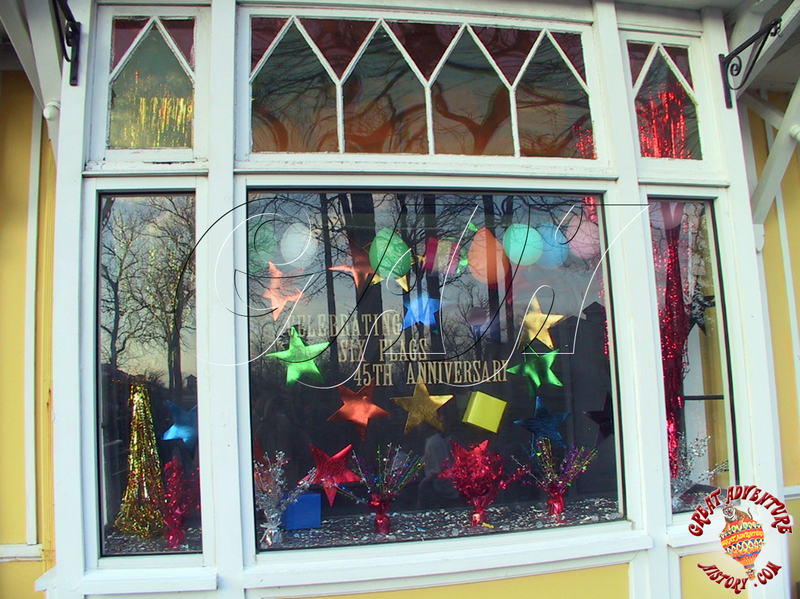 Many of the gingerbread style details were designed to relate to the nearby Gingerbread Fancy restaurant. 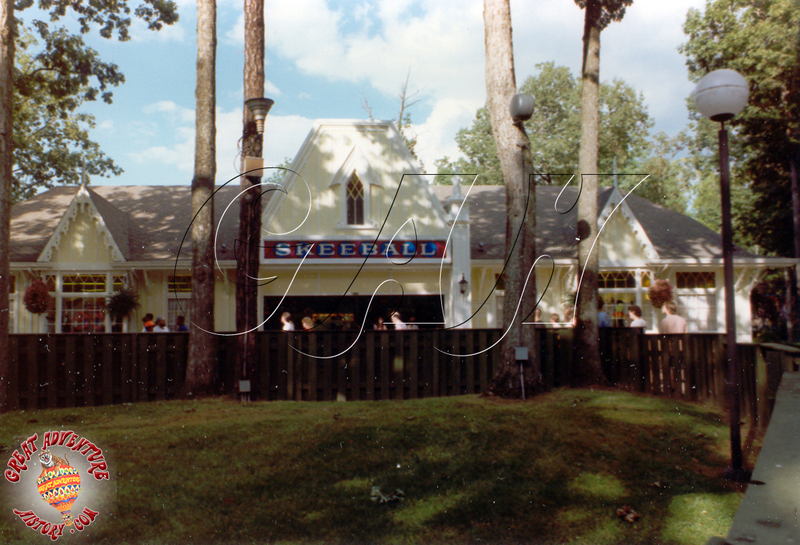 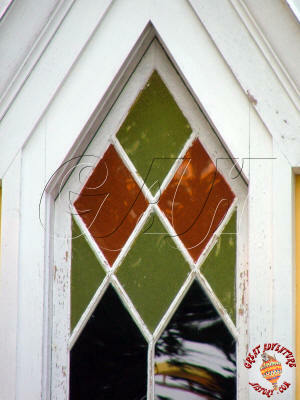 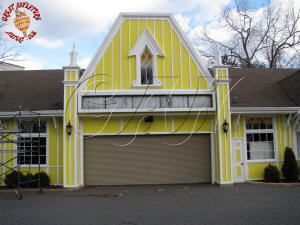 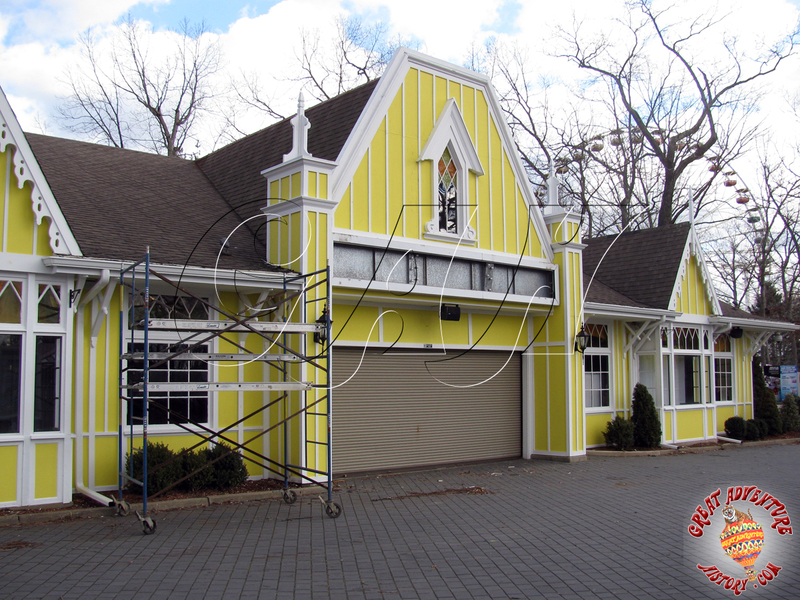 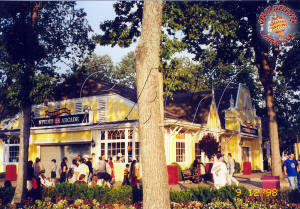 The architectural style of Skeeball Barn was also similar to the Lightnin' Loops Cafe which was built at the same time. Both buildings featured dormers with decorative trim pieces framing them as well as decorative upper level windows featuring colored glass. 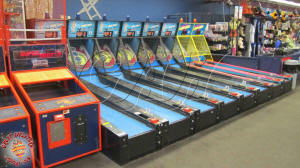 Six Flags Great Adventure has shared a unique connection with Skee-ball. Mark Kane who began his theme park career at the park would eventually go to work for the Skee-Ball corporation and run the company for a time before coming back to work for Six Flags working in top management spots in several parks. 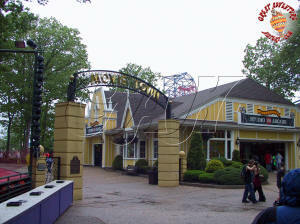 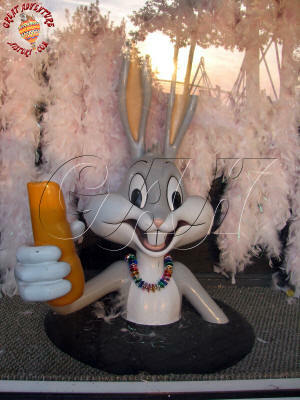 In 2006 he was named Park President of Six Flags Great Adventure, and served in that roll through mid-2010. 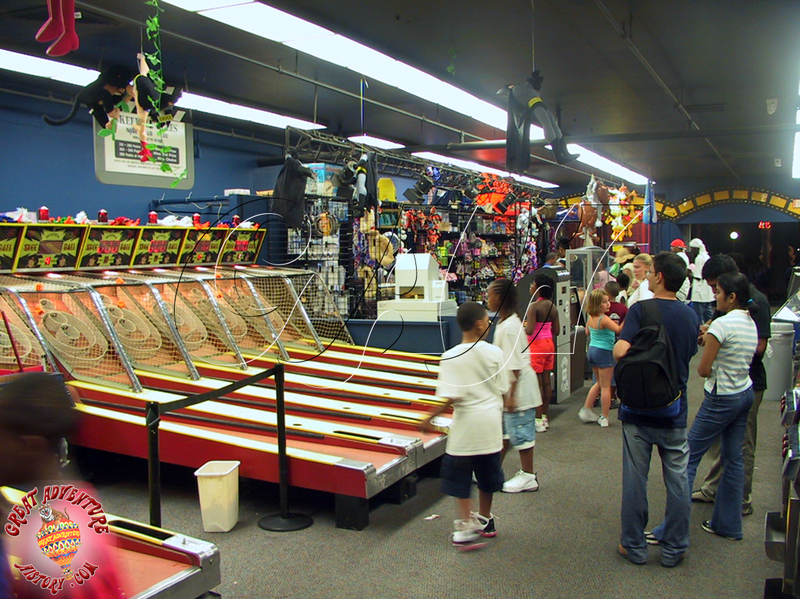 As time has gone on and Skee-ball has faded in popularity, the number of Skee-ball machines has been further reduced from season to season. 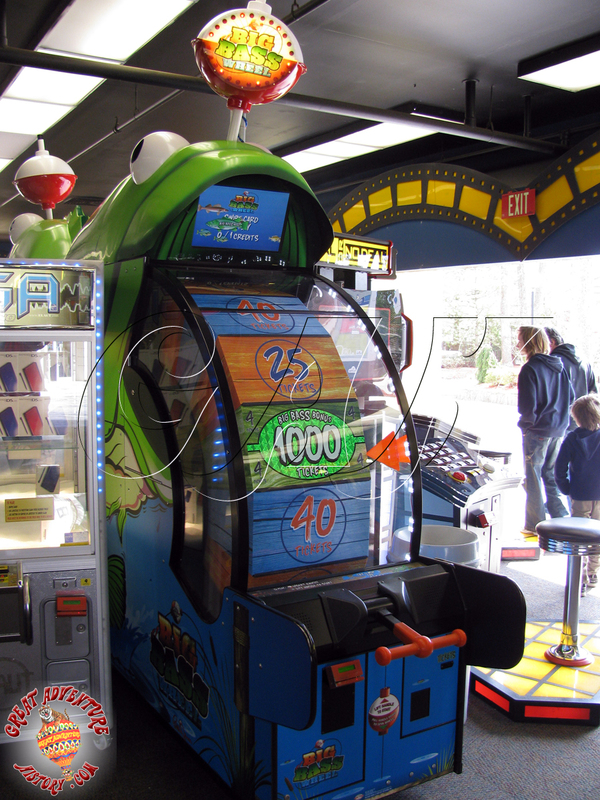 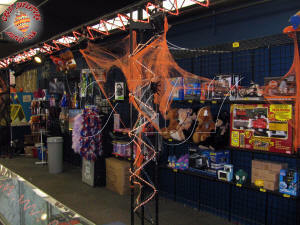 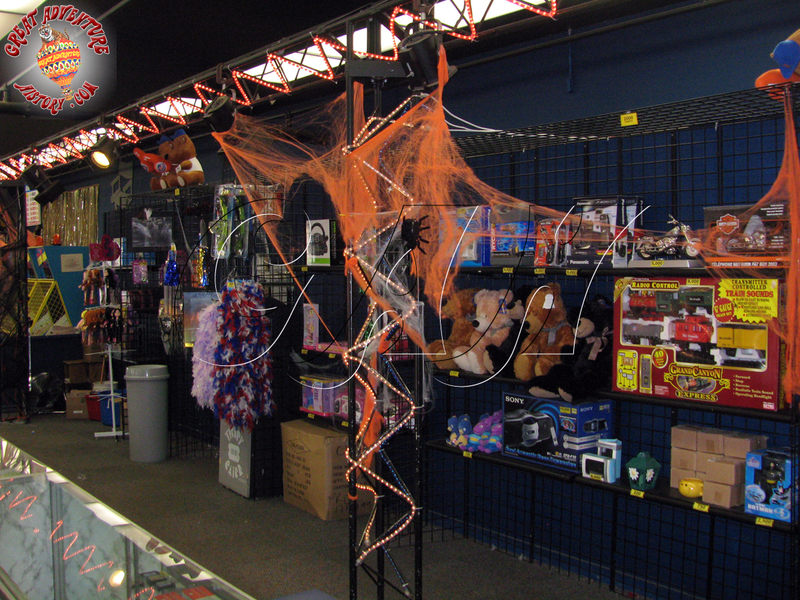 As more exciting and elaborate arcade machines have been developed more of the building has been devoted to the flashier new machines, though the prizes remain more or less the same from year to year. Even new style Skee-ball machines have replaced the classic machines that originally filled the building.